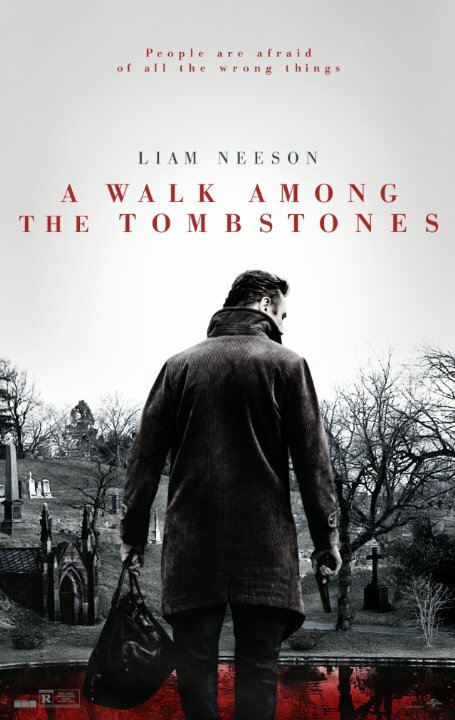 A Walk Among the Tombstones is a walk among all the tropes and clichés that have come to define Liam Neeson’s movies of late. A dark protagonist with a haunted past? Check. A race against time to save the day? Check. Gunfights? Gravelly voice? Check and check. However, unlike previous Liam Nesson fare, A Walk Among the Tombstones is not a breakneck thriller or glossy action movie, but a solid—if somewhat uninspired—film noir. A Walk Among the Tombstones is set, somewhat laughably to viewers above a certain age, in 1999, with flashbacks to a shooting carried out by then New York police detective Scudder in 1991. The indefatigable detective pursues the case through New York’s colour-leeched back-alleys and streets, moving from one lead to the next, ever onwards towards the expectedly unexpected resolution of the case. The movie is tightly plotted and well shot, lessening the dissonance that might have been created from setting a movie in 1999 – Y2K references notwithstanding. Scott Frank (who also wrote the screenplay) makes an accomplished directorial debut and manages to coax a solid performance out of Neeson, who has sometimes been guilty of phoning-in performances. Liam Neeson’s granite-faced and gravelly-voiced hero is the heart of this movie and the audience spends the majority of its time with Scudder, looking out of his eyes at the mean streets of New York. Neeson’s Matt Scudder is a solid leading man; less action hero than the Taken series Brian Miles, he nevertheless has a very particular set of skills that enable him to hunt down those he’s looking for. Scudder is a stoic and world-weary hero, and the movie is as much a character study as a tightly plotted thriller. Scudder, a man looking to make amends, takes the case of a drug-dealer, to take on two even worse criminals, and A Walk Among the Tombstones takes an unflinching look at a world where nothing is black or white—except perhaps Scudder’s notion of justice. Although much better than some of Neeson’s recent attempts – the woeful Taken 2, the forgettable Non-Stop, the confusing Unknown – A Walk Among the Tombstones is not perfect. The two antagonists, serial killers targeting the spouses of drug dealers, are curiously ill defined and one-note. Frank fails to give them a motive for their terrible crimes, clearly trying to up the grittiness stakes and make a comment about the banality of evil. Nevertheless, this lack of character development falls flat, for me, and raises more questions than answers, although perhaps that is the point. The movie also saddles Scudder with the obligatory sidekick—in this case street-smart homeless youth “TJ” who is engagingly depicted by newcomer Brian Bradley (also known as Astro). While the Scudder-TJ relationship gives our hero an opportunity to show audiences a different, even light-hearted, side of himself, the inclusion of characters like this, in movies like this, has always annoyed me. Based on a series of books by Lawrence Block, there are plenty more Matt Scudder cases to bring to the big screen, and in a world where Taken 3 is due out in 2015, Liam Neeson would do well to ignore the big-budget crowd-pleasers and focus on more considered and cerebral installments.